Are astrologers really able to prognosticate—to see the future as supposedly foreordained by the stars? Something wonderful happened to me in 2003 that I never saw coming. Had it been foreseen by stargazers in their forecasts for me in that year? What about a horoscope I commissioned for a special individual on an earlier occasion: How accurate did it prove to be? 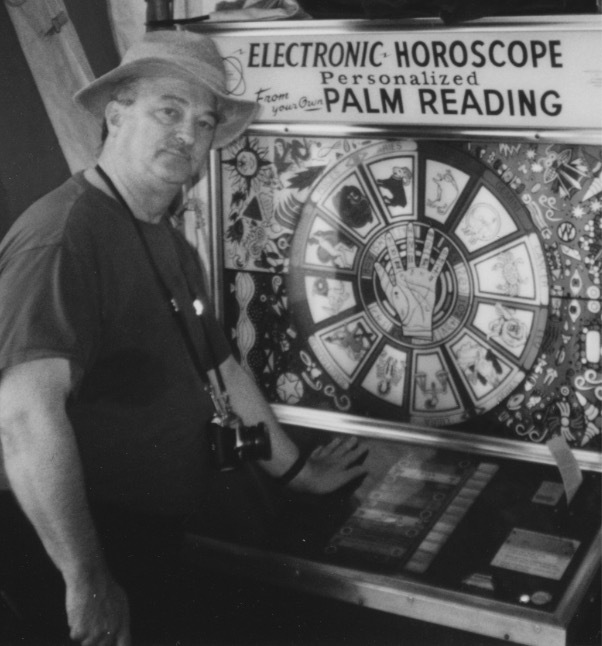 And what about a unique “Electronic Horoscope” I once tested at a carnival arcade? Bypass the many objections astronomers and other scientists make to the movements of the planets as fixed astronomical calculations. Why is someone born at a certain time, on a certain day, in a certain part of the world of a certain nature? Did the originators of astrology study the traits of millions of people and discover that all those born at a specific time had identical characteristics and futures? No! Nor has it been proven since that the early fictions are fact. Figure 1. 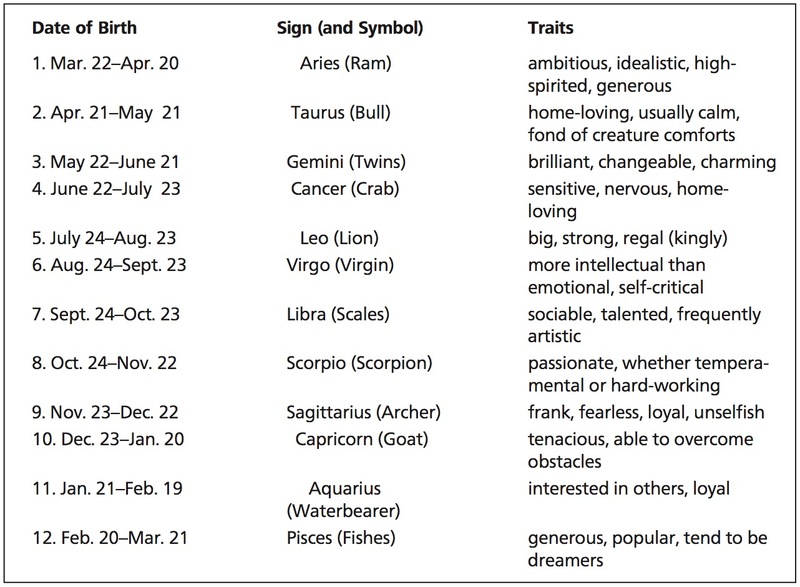 Astrological signs, symbols, and traits by Evangeline Adams (1931). You will discover a beautiful thirty-six-year-old daughter you did not know you had, along with two grandsons. Your life will be changed forever. This is the astrological forecast I should have received for 2003, but it never came. Should not that remarkable occurrence have been “in the stars”? The discovery was the big event in my life that year, to say the least, but apparently no astrologer (or, for that matter, palmist, tarot reader, or other fortune-teller) had had an inkling of it. Not that I had checked them all, of course, but over the years I have visited many prognosticators and been unimpressed with their offerings—very unimpressed. After the wonderful revelation of parenthood in the fall of 2003, I decided to purchase three astrological guides that were still available on bookshelves. At last I am getting around to writing my assessment of these, although I thumbed through them at the time for their forecasts for me. Having been born on December 1, I am, astrologically speaking, a Sagittarius. Such folk “are always seeking to expand their horizons” says one astrological guide (Polansky 2002, 299), being “noted for the development of the mind—the higher intellect—which understands philosophical, metaphysical and spiritual concepts.” That’s me all right, a poet, although the guide seems unaware of my analytical, detectivist bent. Another guide, aimed exclusively at Sagittarians, is by famed astrologer Sydney Omarr who states (2002, 176), “Sagittarius is the natural cheerleader of the Zodiac, spurring others on to make the most of themselves.” I certainly would like to be like that. Regarding actual dates, the guide by Polansky (2002, 306–307) predicted a dynamic influence on Sagittarians by Uranus for the period of March 1 to September 15, specifically “a need for breaking the domestic routine (the rut), the domestic patterns and stifling family relationships.” But how wrong could one be? 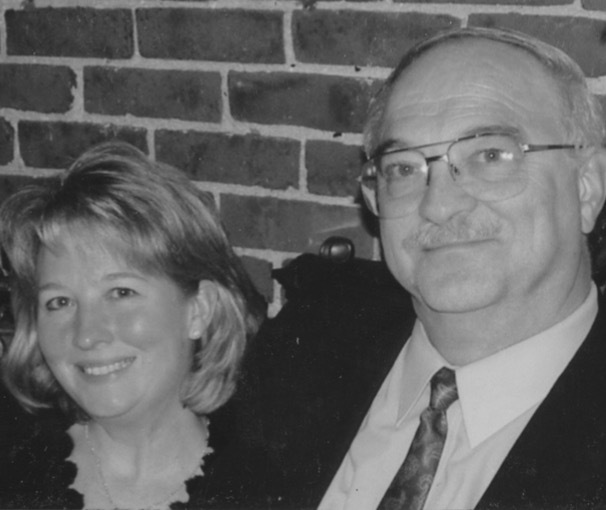 My family relationships were anything but stifling: As to immediate family, my parents were dead; I was largely estranged from my only sibling (an older brother); and I had neither wife nor children. That was to change, but the drama began with positive DNA tests a month later, on October 14. Polansky not only missed my learning of the existence of my daughter but also missed the big event for November: father and child meeting each other for the first time, on the 26th (see Figure 2). Instead, almost laughably the stargazer foresaw possibly “upheavals with uncles or aunts” (Polansky 2002, 327–330). A little 2003 Zodiac Guide failed equally, seeing only “new friends” and “home improvements” for November (Smither 2002, 47). Well perhaps the well-known astrologer and “psychic” Sydney Omarr would do better with his volume devoted entirely to Sagittarius. For October 14 Omarr did caution, “Be sure to obtain information about legal rights and permissions,” and he predicted a “romantic involvement.” However, I’m skeptical that that was supposed to mean, “DNA results reveal a long unknown child”! For November 26, did he see that I would travel from Amherst, New York, to Lexington, Kentucky, to meet my daughter? Alas, to the contrary, he advised: “Stay close to home. Stress harmony, voice, music, romance. What you have been seeking is right there, where you live . . .” (Omarr 2002, 287). Not to be too technical, I believe that would be counted as a miss. In the entire matter, astrologers were worse than useless. Unfortunately, in what I could not distinguish from a computer printout, the ten-page reading that arrived seemed to be a generic one, suitable for anyone to read into it whatever he or she wanted (except for the subject’s birthdate of December 22, 1948, being acknowledged here and there). Despite being dead, the subject was blithely informed that “there will be financial ups and downs,” was most belatedly warned to “take special care against violence” (September 9, 18, 27), and was advised to “search for a deeper and more important life purpose,” along with other stock sayings (Key 1991). None of this was helpful to a man who died over nine years earlier. Perhaps it will be thought unfair to have sought, as a test, a reading for a dead person, but this personal forecast purported to involve long time periods, and it occasionally referred to the past. It seems to me that if the oracular forces cannot even know if the subject is alive or dead, the pronouncements cannot really be meaningfully accurate. I did two things, both pretty simple. First, I decided to obtain two readings of the same hand, scanned as similarly as possible. The presumption would be that—if the method of analysis had merit—the readings would be the same each time for the same hand. In fact, however, they were completely different—consistent with random printouts from a bank of readings, generalized statements that seemingly fit pretty much anyone. YOUR PALM READING INDICATES A STABLE AND CONSTRUCTIVE PERSONALITY. YOU ARE HIGHLY METHODICAL AND PERSEVERING. YOU ARE CHARACTERIZED BY HONORABLE DEALINGS ESPECIALLY IN MONEY MATTERS AND GREAT RELIANCE CAN BE PLACED UPON YOU. YOU ARE VERY THOROUGH IN YOUR WORK AND YOUR CONSTRUCTIVE ABILITIES SHOULD BE GIVEN FREE REIN. YOU ARE ABLE TO GET ALONG EASILY WITH OTHERS. YOUR HIGHLY SENSITIVE INTELLECT AND PRACTICAL PHILOSOPHY OF LIFE MAKE IT EASY FOR YOU TO HANDLE LARGE ISSUES INVOLVING THE PUBLIC AS A WHOLE. . . . YOUR PALM READING INDICATES THAT YOU ARE GENEROUS TO A FAULT WHERE YOUR FRIENDS ARE CONCERNED. YOU TEND TO BE SHY AND RESERVED WHEN MEETING PEOPLE. YOU ARE A PERFECTIONIST AND WORK HARD AT DOING YOUR JOB WELL. YOU TAKE GREAT PRIDE IN THE APPEARANCE OF YOUR HOME. YOUR HOROSCOPE COMBINING THESE PERSONALTY TRAITS WITH THE ASTROLOGICAL ASPECTS OF YOUR SIGN, SHOW [sic] A HEALTHY TREND TOWARD A MORE OUTGOING AND CONFIDENT WAY OF LIFE. . . . YOUR PALM READING INDICATES A PERSON WITH GREAT POWERS OF DISCRIMINATION AND INSIGHT. YOUR INTELLECTUAL DEX­TERITY, YOUR INTUITIVE FACULTIES, THE VERSATILITY OF YOUR WHOLE PERSONALITY GIVE YOU THE ABILITY TO DO WELL IN MOST FIELDS OF ENDEAVOR. THE SPEED OF YOUR MENTAL AND PHYSICAL REACTIONS IS ADVANTAGEOUS. YOUR CHARM AND UNDERSTANDING IN YOUR CONTACTS WITH OTHERS IS A RESULT OF ALERTNESS OF YOUR INTERESTS. YOU HAVE AN INTENSE LOVE OF DETAIL AND A HEALTHY SKEPTICISM AND YOUR MIND PREFERS TO CONCENTRATE ON THE WORLD OF IDEAS RATHER THAN OF ACTION. . . . The device is thus revealed as a deception—suitable for entertainment only. I suspect that the cards were pre-printed and that the machine therefore neither scanned nor analyzed; it only dispensed pre-printed stock readings. My three investigations—(1) comparing a major life event with three commercial horoscope readings, (2) commissioning a personalized reading for someone who happened to be deceased, and (3) experimentally testing an arcade “Electronic Horoscope”—all showed that such astrological readings are about as dependable as an assortment of slips from fortune cookies. Here is my forecast for you: Astrologers will have you in their sights, so you must guard against having a mind and wallet that are too open to pilfering. Bierce, Ambrose. 1967. Devil’s Dictionary (originally published as The Cynic’s Word Book in 1906) New York: Castle Books. Christopher, Milbourne. 1970. ESP, Seers & Psychics. New York: Thomas Y. Crowell. Dean, Geoffrey, Arthur Mather, and Ivan W. Kelly. 1996. “Astrology,” in Stein 1996, 47–99. Key, Glenn. 1991. Personal Year Forecast for Jean Michel Gambet 1991 to 1992. Commissioned by Joe Nickell and received October 4. Nickell, Joe. 1991. Wonder-workers! How They Perform the Impossible. Buffalo, NY: Prometheus Books.———. 2005a. Intuition: The case of the unknown daughter. Skeptical Inquirer 29(2) (March/April): 12–13, 33. ———. 2005b. Secrets of the Sideshows. Lexington: University Press of Kentucky. Nickell, Joe, with John F. Fischer. 1992. Mysterious Realms: Probing Paranormal, Historical, and Forensic Enigmas. Buffalo, NY: Prometheus Books.Omarr, Sydney. 2002. Sydney Omarr’s Day-by-Day Astrological Guide for 2003: Sagittarius. New York: Signet. Polansky, Joseph. 2002. Your Personal Horoscope 2003. London: Thorsons. Smither, Suzanne. 2002. 2003 Zodiac Guide. Boca Raton, FL: Media Mini Mags. Stein, Gordon, ed. 1996. The Encyclopedia of the Para­normal. Amherst, NY: Prometheus Books.